DM STAT-1 Consulting's Founder and President Bruce Ratner, Ph.D., The Significant StatisticianSM ,has made the company the boutique firm for statistical modeling and analysis, data mining, and machine-learning. DM STAT-1 specializes in all standard statistical techniques, as well as recognized and innovative machine-learning methods, such as its patented GenIQ Model. DM STAT-1 achieves its clients’ goals across varied industries: direct and database marketing, banking, insurance, finance, retail, telecommunications, healthcare, pharmaceutical, publication & circulation, mass and & direct advertising, catalog marketing, e-commerce, web-mining, B2B, risk management, and nonprofit fundraising. 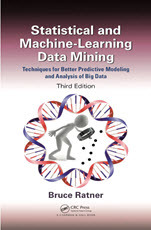 Bruce’s par excellence consulting expertise is apparent, as he is the author of the best-selling book Statistical Modeling and Analysis for Database Marketing: Effective Techniques for Mining Big Data. Bruce ensures the optimal solution methodology for his clients’ marketing problems with rapid startup and timely delivery of project results. Bruce executes the highest level of statistical practice for his clients’ projects. He is an often-invited speaker at public industry events, such as the SAS Data Mining Conference, and private seminars at the request of Fortune magazine’s top 100 companies. Bruce has his footprint in the predictive analytics community as a frequent speaker at industry conferences and as the instructor of the advanced statistics course sponsored by the Direct Marketing Association for over a decade. He is the author of over 100 peer-reviewed articles on statistical and machine-learning procedures and software tools. He is a co-author of the popular textbook the New Direct Marketing and is on the editorial board of the Journal of Database Marketing. Bruce is also active in the online data mining industry. He is a frequent contributor to KDNuggets Publications, the data mining community's top resource. His articles on statistical and machine-learning methodologies draw a hug monthly following. Another online venue in which Bruce participates is the professional network LinkedIN. Bruce’s seminal articles posted on LinkedIN, covering statistical and machine-learning procedures for big data, have sparked countless of rich and spawning discussions. In addition, he is the author of his own DM STAT-1 Newsletter on the web. Results-Oriented: Increase Response Rates; Drive Costs Down and Revenue Up; Increase Customer Retention; Stem Attrition; Check Churn; Increase Customer Affinity - Match Products with Customer Needs; Enhance Collections & Recovery Efforts; Improve Risk Management; Credit Risk Models and Basel Compliant Risk Rating Scorecards; Strengthen Fraud Detection Systems; Increase Number of Loans without Increasing Risk; Work Up Demographic- based Market Segmentation for Effective Product Positioning; Perform Retail Customer Segmentation for New Marketing Strategies; Construct New Business Acquisition Segmentation to Increase Customer Base; Identify Best Customers: Descriptive, Predictive and Look-Alike Profiling to Harvest Customer Database; Increase Value of Customer Retention; Generate Business-to-Business Leads for Increase Profitability; Target Sales Efforts to Improve Loyalty Among the Most Profitable Customers; Improve Customer Service by Giving Marketing and Sales Better Information; Build CRM Models for Identifying High-value Responders; Build CRM Models to Run Effective Marketing Campaigns; Improve Human Resource Management - Retain the Best Employees; Optimize Price and Package Offerings; Right Offer at the Right Time with the Right Channel; Maintain Product Profitability and Support Effective Product Management; Increase the Yield of Nonprofit Fundraising Campaigns; Optimize Customer Loyalty; CRM for Cross-Sell and Up-Sell to Improve Response Rates and Increase Revenue; CRM Segmentation for Targeted Marketing; Workforce Optimization; Personalize Recommendations for Information, Products or Services; Credit Scoring to Control Risk; Retain Best Customers and Maximize Their Profits; Nonprofit Modeling: Remaining Competitive and Successful; Subprime Lender Short Term Loan Models for Credit Default and Exposure; Retail Revenue Optimization: Accounting for Profit-eating Markdowns; Nonprofit Modeling: Remaining Competitive and Successful; Detecting Fraudulent Insurance Claims; Demand Forecasting for Retail; Cross-Sell and Up-Sell to Improve Response Rates and Increase Revenue; Credit Scoring for Controlling Risk; and so on. Analytical Strategy: Build, Score and Validate Logistic Regression Models, Ordinary Regression Models, Variant Regression-based Models, Decision-Tree Models, Machine-Learning Models, Quasi-Experimental Design Models, Marketing Mix Optimization Models; Latent Class Models, Survival/Proportional Hazards Models, and Structural Equation Models, Machine-Learning Conjoint Analysis, Time-Series (Decomposition, Exponential Smoothing, ARIMA, Vector Auto-Regression), and all other models in the data analyst's tool kit for problem-solution approaches. Model Types: Acquisition/Prospect Models, Retention Models, Attrition Models, LifetimeValue Models, Credit Risk Models, Response-Approval Models, Contact-Conversion Models, Contact-Profit Models, Customer-Value Based Segmentation Models; Credit Scoring Models, Web-traffic Models, Balanced Scorecard Models, Cross-sell/Up-sell Models, Zipcode-based Models, Blockgroup-based Models Decision-Tree Inventory Forecast Models, Models for Maximizing Profits from Solicitations, Mortgage and Credit Card Default Models, Trigger Marketing Model, Fraud Detection: Beyond the Rules-Based Approach, Workforce Optimization Model, Collaborative Filtering Systems, and an assortment of results-related analytical strategies. Analytical Tactics: Procedure When Statistical Model Performance is Poor; Procedures for Data that are Too Large to be Handled in the Memory of Your Computer; Procedures for Data that Are Too Large to be Handled in the Memory of Your Computer; Detecting Whether the Training and Hold-out Subsamples Represent the Same Universe to Insure that the Validation of a Model is Unbiased; Data Preparation for Determining Sample Size; Data Preparation for Big Data; The Revised 80/20 Rule for Data Preparation; Implement Data Cleaning Methods; Guide Proper Use of the Correlation Coefficient; Understand Importance of the Regression Coefficient; Effect Handling of Missing Data, and Data Transformations; High Performance Computing for Discovering Interesting and Previously Unknown Information in - credit bureau, demographic, census, public record, and behavioral databases; Deliverance of Incomplete and Discarded Cases; Make Use of Otherwise Discarded Data; Determine Important Predictors; Determine How Large a Sample is Required; Automatic Coding of Dummy Variables; Invoke Sample Balancing; Establish Visualization Displays; Uncover and Include Linear Trends and Seasonality Components in Predictive Models; Modeling a Distribution with a Mass at Zero; Upgrading Heritable Information; "Smart" Decile Analysis for Identifying Extreme Response Segments; A Method for Moderating Outliers, Instead of Discarding Them; Extracting Nonlinear Dependencies: An Easy, Automatic Method; The GenIQ Model: A Method that Lets the Data Specify the Model; Data Mining Using Genetic Programming; Quantile Regression: Model-free Approach; Missing Value Analysis: A Machine-learning Approach; Gain of a Predictive Information Advantage: Data Mining via Evolution; and many more analytical strategy-related analytical tactics. DM STAT-1 Consulting is the leading firm for analysis and modeling in the DM Space (direct/database marketing (DDBM)), customer relationship management (CRM), and knowledge discovery/data mining (KDD). DM STAT-1 specializes in the full range of standard statistical techniques, statistics and machine learning hybrid methods, and cutting-edge data mining tools to successfully achieve their clients' DM goals. DM STAT-1's par excellence data mining expertise is highlighted by its GenIQ Model, a 3-in-1 tool for variable selection, data mining and model building. DM STAT-1 assures: the client's marketing decision problems will be solved with the optimal problem-solution data mining methodology; rapid start-up and timely delivery of projects results; the client's projects will be executed with the highest level of statistical data mining practice. Typical projects worked on include Data Mining & Knowledge Discovery; Data Mining with GenIQ Model; Data Mining for Direct Marketing; Data Mining for Database Marketing; Data Mining for B-to-B; Data Mining for CRM; Data Mining Regression; Data Mining Classification; Data Mining Tree Model; Data Mining Predictions; Data Mining Segmentation; Text Data Mining; Data Mining Analysis; Data Mining Optimization; Data Mining Modeling; Data Mining Business Rules; and Data Mining Strategy.